One day, I will not start off a blog post with “So, it’s been a while…” One day. But today will not be that day! 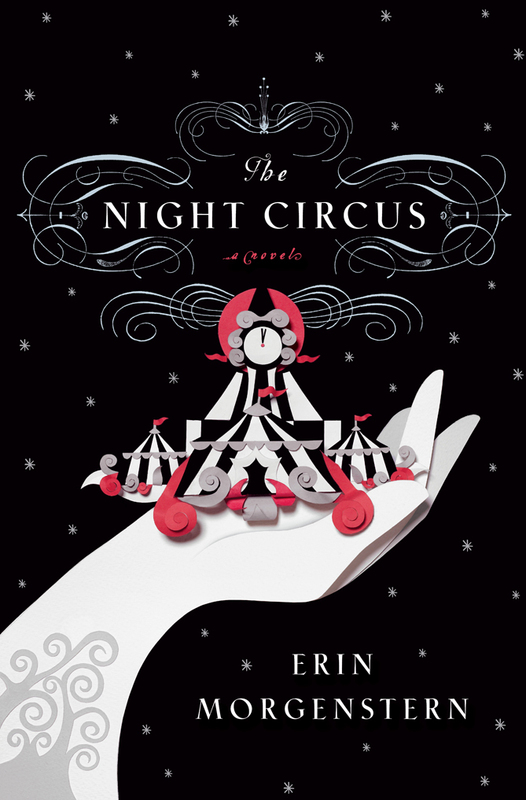 So for a lot of 2011, you may have heard buzz about a book called The Night Circus. I first heard about the book in late 2010, and I couldn’t wait to get my hands on it. A black-and-white mysterious circus! Magicians! Late 19th century! It was like the book had been especially written for me. I was lucky enough to get my hands on an ARC in March and immediately devoured it. It surpassed my expectations. At one point I emailed the author and told her I wished the world of The Night Circus was real. I wanted it so badly to be real. 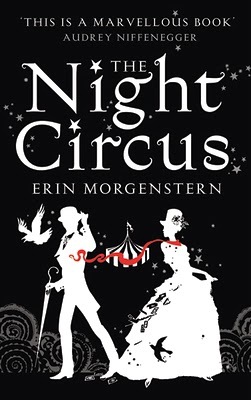 It is 1886, and a mysterious black and white circus is travelling through countries, only open at night. The tents are so fantastic as to be unreal: ranging from an ice garden to a wishing tree, and acts from a contortionist to an illusionist who seems to have a true gift of magic. This is no ordinary circus. Celia and Marco are magicians who have been bound into a magical duel by their mentors. The circus is their venue of combat. But their admiration gradually develops into love, and the circus turns from a battleground to how they profess their love for each other. But their duel may have fatal consequences for all involved. The Night Circus is one of the best books I’ve read. The circus is described in lavish detail, from the scent of cool evenings to the descriptions of the circus’ many culinary offerings. The book is a feast for the senses. The characters are not without fault, and often motivated by their own intentions, but you can’t help but become invested them throughout the narrative. I was warned before reading The Night Circus that I would wish its world were real, and indeed, by the time I reached the end, I wanted nothing more than to actually visit Le Cirque des Rêves. I adored this book so much that I reread it. (To put this in context, I can count on one hand the amount of books I’ve reread.) It was even better the second time round, since this time I knew what to expect and could marvel at how all the plot threads were woven together. I can’t wait for Erin Morgenstern’s next book. This was one of my favourite reads of 2011. Highly, highly recommended. I, er, appear not to have updated since June! Oops. It was completely unintentional, so I’m going to be doing my best to remedy this in the coming weeks. 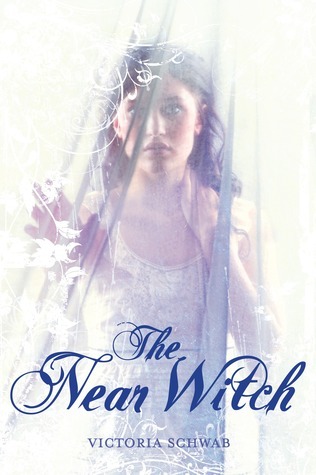 For now, I’m here to recommend a book that I read recently and loved: The Near Witch by Victoria Schwab. I’d been looking forward to this book for well over two years, having followed Victoria’s blog since before she sold The Near Witch. It seemed strange to finally hold a copy in my hands! The story is like a modern fairy tale: There are no strangers in the town of Near, until a stranger appears like mist and children begin disappearing. The writing is soft, yet fluid, as mesmerising as your favourite fairy tale. The novel flows incredibly well, though this makes it difficult to put down (I took the easy way out, and started this on a day off so I could read as much of it in one sitting as possible). Yet it’s is not just a fairy tale, painting a picture of a town so secluded that it takes little for the seeds of distrust to flower into potential terror. Lexi is a brilliant character, reminding me of Tamora Pierce’s and Kristin Cashore’s narrators: courageous even while fearing what’s happened to the children and what could happen to the stranger; a dreamer yet also a practical girl who’s grown up in the moors. Her father taught her to track and read the moor’s signs, and she desperately longs for a life different than the one expected of her. Everything changes when she sees the stranger, blurry at the edges like mist, at her window. What makes this different to a lot of YA novels out there is that the moor and the wind themselves are practically characters in themselves. This book made me long for autumn storms and to hear the wind howling around my house, making the trees sway and the leaves rustle. It made me wish for overcast days and rain and fallen leaves. I found myself thinking about The Near Witch long after I’d finished. I can’t wait for Victoria Schwab’s next book–it’s going to be great. There are very few authors that I will drop everything to read something new by them. Normally, I can contain myself enough that I’ll finish the book I’m currently reading. Sarah Rees Brennan is one of those authors. 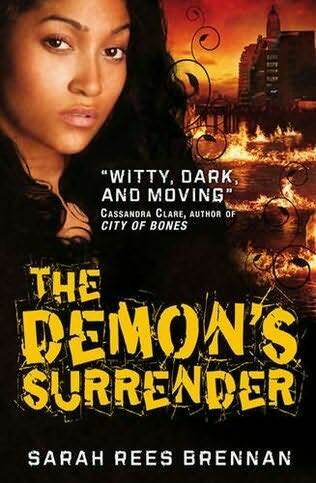 I dug my copy of The Demon’s Surrender out of the just-delivered boxes because I wanted it NOW. It lived up to my expectations and then some! Sin’s POV is different to Nick’s and Mae’s, presenting an alternate view on characters and events that have already happened, yet similar enough in atmosphere and tone that it fits into the trilogy. I fell for Sin, her voice and how she viewed the world, and the secrets that were revealed about her and the Goblin Market. The Demon’s Surrender is a fitting conclusion to Sarah Rees Brennan’s trilogy, tying up plot threads woven throughout the three books and concluding ones developed in Surrender itself. In classic SRB style, of course, there were some twists that I didn’t see coming, one which had me shouting “NO!” at the top of my lungs. When I finished it and closed the book, I realised I was sad that the trilogy was now finished and there would be no more books about Nick, Alan, Mae, Jamie and Sin, and their world of magicians, demons, and the Goblin Market. I can’t wait for Sarah Rees Brennan’s next book! 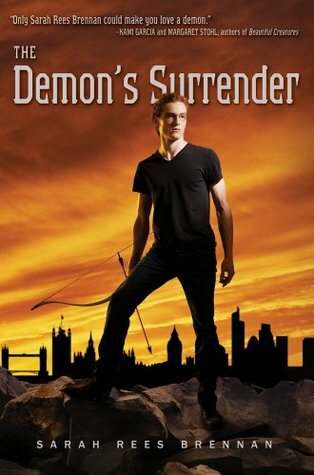 To celebrate the release of The Demon’s Surrender, I’m giving away a copy of the UK edition! To enter, leave a comment in this post with your name, your email, and something about the trilogy that you enjoy (a favourite character, a favourite scene, whatever you want). The deadline is Friday, 24th June at 9pm EST, and then I’ll pick a winner with the help of a random generator. The giveaway is open internationally. I started reading this book knowing it was set in New York City, concerned two friends, and that A Wrinkle in Time played an important part. I devoured it in two days–it’s a short, but captivating book–and when I finished it, I immediately started flipping back and putting some pieces together. It’s the kind of book that all clicks together and requires a reread for it all to make sense. The best way I can describe is that it’s like a wibbly-wobbly-timey-wimey episode of Doctor Who, where everything is layered and all clicks together at the end. Highly recommended! As winter melts into spring, will a year of romantic near-misses end with the French kiss Anna has long awaited? I was so excited about this book since I first heard about it in early 2010. My copy finally arrived in January and I promptly dropped the book I was reading to start Anna. It didn’t disappoint! Perkins wonderfully depicts Paris and being an outsider learning their way through an unfamiliar place. Even better, this is a book that loves the idea of falling in love–the build up to Anna and Etienne’s growing attraction is almost better than the outcome. The attraction between them slowly but steadily develops, built with every conversation, glance and brief touch. A wonderful, wonderful book. I can’t wait for Stephanie Perkins’ next book! How does one talk about love? At the core of this desire is the belief that everything can be perfect. We are all beginners when it comes to love, from those tentative first dates to learning how to live with, or without, someone. But how does one describe love? How does one chart its delights and pleasures, its depths and desolations? Do we even have the right words to describe something that can be both utterly mundane and completely transcendent, pulling us out of our everyday lives and making us feel a part of something greater than ourselves? David Levithan’s The Lover’s Dictionary starts where we all once started – with the alphabet. I first discovered David Leviathan when I stumbled across Boy Meets Boy years in a bookshop during my university years. (Boy Meets Boy also has the distinction of being the first YA GLBT novel I read.) The Lover’s Dictionary is Leviathan’s first adult novel, a chronicle of the ups and downs of a relationship through dictionary entries. The novel is slim, and some of the entries are only a sentence long, but there is powerful emotion layered in the words. I was speechless when I finished and it stayed with me long after I closed the book. A novel that reminds you of the wonderful and painful nuances of love. I’ve been writing like crazy for the past few weeks; apologies for the blog silence! Unfortunately, I can’t yet talk about what I’m writing, so for now I decided to do a book recommendation post. Before I Fall is, simply, one of the best depictions of the ‘mean girl’ character I’ve read. Even describing the main character as a mean girl doesn’t present the full picture: she’s a flawed character, with both good and bad aspects. This book also has some of the most fantastic teenage characterisations I’ve read in YA fiction–throughout the narrative, I kept thinking, “Yes, these characters are recognisably teenage, I fully believe this.” They don’t represent every type of teenager, obviously, but the ones they do are wonderfully developed and authentic. I started to suspect over halfway through the book how it would end, but reaching the last page and having to close the book was still wrenching. I’ve read Holly’s previous YA books, but was really excited by this new series, where magic was outlawed in the 1930s, turning it into a dark, almost feared profession operating underground and leading to the rise of prominent, morally-dodgy magic (or ‘worker’) families. Cassel is the youngest of his worker family, but the only one unable to work magic. Cassel has more important things on his mind, such as the fact he killed his best friend when he was fourteen, but can’t actually remember the murder. I picked this up based on several recommendations and WHOA BOY did it not disappoint. I devoured this on a train ride and the first thing I did when I had internet access again was check the release date for the next book (“November ’10! The same year, oh my god, this is so exciting!” were my exact words). I’m not even sure where to start: the world building is fabulous, the characters–both human and god–are fabulous, the writing is fabulous. The disjointed, literary, almost conversational style perplexed me at first, but when I realised what it meant… well, it was a slightly embarrassing reaction to have on a train around other people. I’m just sayin’. Basically: if you enjoy fantasy and want to be surprised by something new, pick this up. Immediately. I heard about this book when a co-worker from another branch sent an email raving about it. So I picked it up when it came out, and it was everything she said it was and more. I couldn’t put it down once I started it and read it while cooking and eating and when I was supposed to be writing… It could be termed an “issue” book, with Lennie struggling to cope in the aftermath of her older sister Bailey’s death, but it’s so much more than that. It’s a book about grief, and living, and death, and loving, and music, and things you probably shouldn’t do but doing them anyway. All of the characters and wonderfully developed with endearments and flaws, the setting of Clover is exceptional (seriously, read this if you’re struggling with the setting of your book, it was a huge help to me), and the slow and wonderfully developed romance between Lennie and Joe had me actually squealing in delight more than once. Interspersed throughout the narrative are snapshots of Lennie’s poetry, written on scraps of paper, takeaway coffee cups, tree trunks and more, all scattered throughout Clover, which are actually mentioned in the book. (A little detail that I adored.) One of the best teen books I’ve read this year.